Slender iceplant, Mesembryanthemum nodiflorum, is a small, succulent, winter-growing annual weed, most common in the eastern Wheatbelt. When it is dead and dry in summer, it contains high levels of sodium, which seems to attract sheep, and high levels of oxalate, which can poison sheep. Signs of poisoning, treatment and methods of reducing the risk of poisoning are discussed. Slender iceplant is a prostrate, succulent annual. Its common name is derived from the glistening crystals of salt along the stems during its early growth. It favours degraded, heavy and saline soils and is particularly prevalent in the eastern Wheatbelt. Individual plants can spread to a metre in diameter and aggregations of plants can cover many hectares. 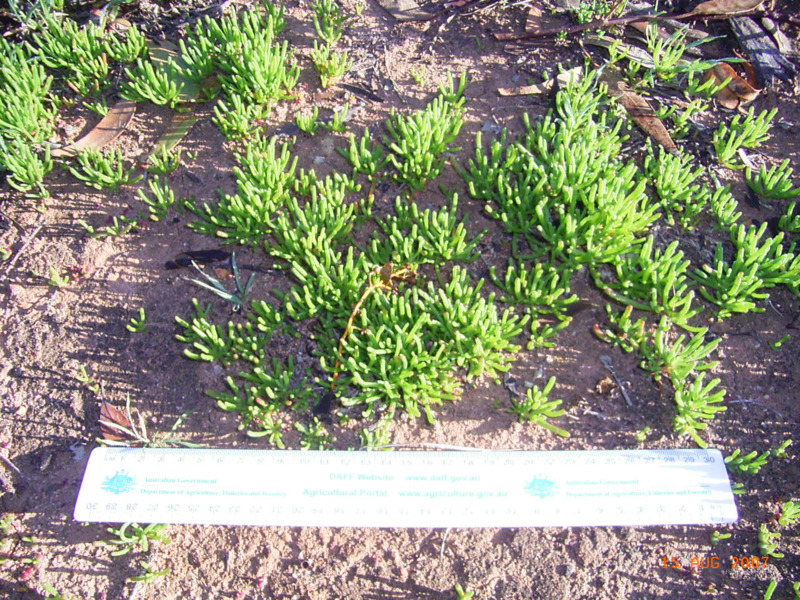 In the Wheatbelt there are other succulent annual weeds, related to slender iceplant, which are sometimes referred to as 'iceplant'. These include common iceplant (Mesembryanthemum crystallinum) and Cleretum papulosum (no common name). These plants may contain potentially toxic levels of oxalate, however they have not been proven to cause stock poisoning. When does slender iceplant cause poisoning? Poisoning normally occurs from October to April. At this time the plant contains a high level of salt (sodium), which seems to attract sheep, but also the level of oxalic acid, the toxic chemical, is at its highest. Iceplant poisoning may occur in both pasture and stubble and usually within 24 hours of sheep being moved into a new paddock. The plant is most toxic when it is dead (greyish, dry and crumbly). It remains toxic while dry and also after summer rain. Drier seasons favour the plant and it is more likely to be a problem after a dry winter. Sheep deaths appear to be less common when more than 25 millimetres of rain falls during summer after the plant has dried out, however tests have shown that oxalate levels do not decline significantly following heavy rain. Deaths from iceplant poisoning have only been reported in sheep. However, other species, including goats and horses, are likely to be susceptible. Cattle are least susceptible to oxalate poisoning. How does slender iceplant cause poisoning? Oxalic acid is absorbed from the sheep’s rumen and enters the bloodstream where it combines with dissolved calcium to form insoluble calcium oxalate crystals. Because less calcium is then available to the animal, normal muscle function and strength are reduced. Calcium oxalate crystals also cause damage to the lining of the rumen and to the kidneys. Affected sheep are unable to stand due to muscle weakness and are often found lying on their chests. They generally lie quietly, with little paddling or struggling. In severely affected animals the head may flop back into the flank. There may be a thick but clear discharge from both nostrils. Muscle paralysis can stop normal rumen movement and gases may accumulate, giving the animal a bloated appearance, especially on the left side. At post-mortem the kidneys may be enlarged, soft and pale-coloured. The outer or inner surface of the rumen may have streaks or spots of bleeding. Usually, fragments of iceplant can be found in the rumen contents. The fruiting bodies, which resemble small grey cloves, are the easiest part of the plant to identify. The prescribed treatment is calcium borogluconate, which is sold under various brand names. It is given according to label instructions as an injection under the skin. Calcium borogluconate is available from stock agents and can be administered by farmers. Successful treatment is most likely if sheep are treated when signs first appear. Treated sheep must be kept upright and not be allowed to lie flat on their sides. Iceplant is killed easily by cultivation or by some herbicides, but it often grows among trees, rocky outcrops and along fence lines, so eradication of the plant may not be possible. Provide sheep with a limestone and salt loose mix or block before and during grazing of risky paddocks. Ensure that sheep are not hungry when put into risky paddocks. A rumen full of roughage is ideal. Provide good hay for a day or two before a paddock change. Always ask your veterinarian to investigate whenever sudden death, high death rates or unusual disease or behavioural signs occur in your livestock. The cause might not be what you think. Call a private or DPIRD veterinarian or the Emergency Animal Disease hotline on 1800 675 888. Livestock disease investigations help provide information to enable Australia to prove freedom from market-sensitive diseases and support livestock and livestock product market access. DPIRD veterinary officers can provide more information about slender iceplant poisoning in livestock. To find the contact details of your closest veterinary officer, go to the Livestock biosecurity program contacts page.